Combine all ingredients in a food processor or a blender. Blend until smooth. Add a couple sprinkles to make it festive. 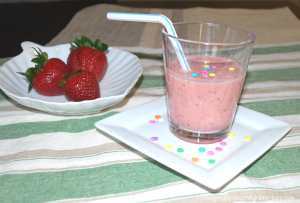 This version is a less thick due to the milk, it will be more like a smoothie. Skim milk will make it thinner than whole milk. 1 Tablespoon honey can replace the sugar if preferred. Use plastic measuring cups and let your child help you find the correct one for each ingredient. Line up the measuring cups in a row from small to big and discuss which one holds the most, which cup holds the least. In the Southern U.S. and California, strawberry season begins in April. In the North, it begins in late May and early June. Fresh picked strawberries from a farm are much sweeter than your store bought fruit. Most store bought fruit are picked a little underripe. You can tell when they're white inside. Unripe berries will not ripen once picked. Ripe strawberries are a deep red color throughout. Smaller berries are often the most flavorful. Strawberries are very healthy for you and when eaten fresh, eight medium-sized strawberries contain 140% of the U.S. RDA for Vitamin C. One cup of strawberries contains about 55 calories.